This functional furniture features storage galore! Product Description Rustic Enchantment. 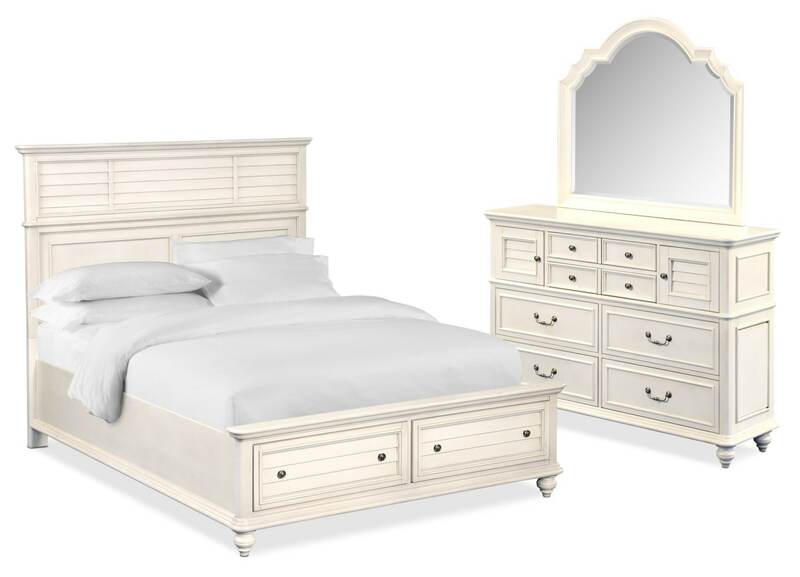 Channel the serenity of a quaint cottage with the Charleston King panel bedroom set with footboard storage. The polished louvered headboard brings out the charm of the rustic countryside. Pewter-finished hardware and lovely tapered legs add exquisite finishing touches, providing you with a well-furnished bedroom. Customer assembly required. Unique Features: Large drawers beneath the bed feature cedar-lined bottoms. Painted finish highlights the silhouette and design of this bedroom furniture. Spacious drawers leave plenty of room for clothing and linens. Drawers: Felt-lined top drawers protect delicate valuables.